Adrian Powter, a Churches Conservation Trust volunteer, will be our guide as we step through the magnificent Norman carved doorway. The many treasures that await include stunningly detailed wall paintings, ancient graffiti and mysterious Middle Age wall markings. 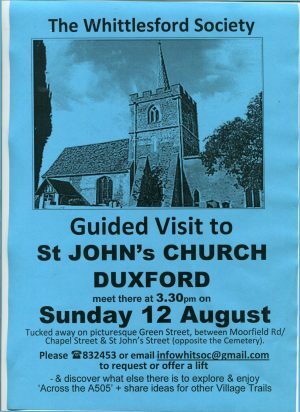 Please make your own way to St John’s, next to the village green and surrounded by attractive old houses, where the tour will begin.